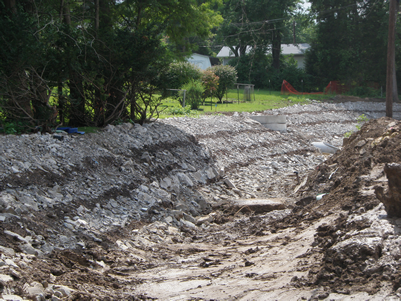 The Malus & Green Park Channel Improvement design alleviates channel bank erosion and bank instability on 1,400 feet of unnamed tributary to Gravois Creek. A 250 ft long rectangular concrete channel splits the project into an upper and lower reach. 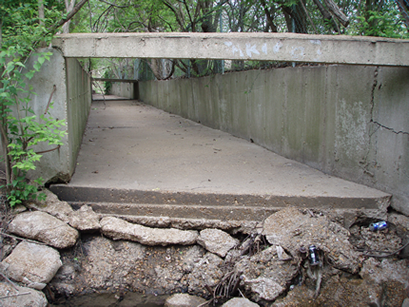 Proposed improvements consist of composite revetment bank stabilization, 13 rock grade control structures, rebuilding of 5 existing storm sewer outfalls and replacement of an undermined modular block wall. The existing culvert outfalls were rebuilt with drop manholes and new discharge pipes to daylight flow at the toe of slope on stabilized rock structures. The drop manholes will dissipate the high energy flows in the structure. The outfall pipes are designed with a 0.5 to 1% slope to further reduce outfall velocities. 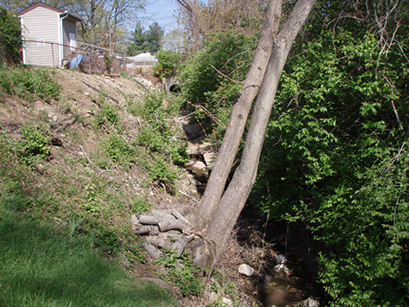 Natural stream morphology is incorporated into the design of all the proposed channel improvements. The step grade controls will dissipate energy as well as focus the high energy flow to the center of the channel and away from the toe. The structures are keyed into the banks and have livestakes installed through the rock. The structures were located such that the channel profile slope between structures is reduced to a stable configuration. The stream energy will be dissipated at the rock structures, thereby reducing the erosive energy on the natural bed and banks between each structure.